Keys and FX Matt J was born with the ability to see notes (and many other strange things) in his head and create songs without playing a note. Matt was classically trained for five years before being released into the public world and the unsuspecting synthesizer population. 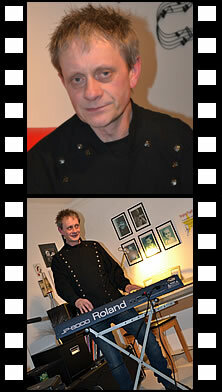 In the 1980’s he was the keyboard genius behind the force that was ‘Tokyo Joe’ and later ‘The Storm’. Matt still plays by ear and sometimes uses his hands .Influenced by the genius of Freddie Mercury and the cold brilliance of Gary Numan he has gone on to be one of the best known synth programmers and players in the Numan and synth community on facebook and soundcloud to the extent that he has programmed sounds for Gary Numan himself. Matt says “It’s Really something to be able to relax in a good covers band with like minded and very capable musicians and a drummer. Hazy days are a breath of fresh air, no stress, just great people sharing a lifetime of loving music.